Most of the images in this Hawaii action gallery are surfing and in particular tow-in surfing at Jaws, with wave heights in the 30-40 ft. range. There are also some shots of windsurfing, kite surfing and skim boarding. Maui is a surfing mecca with many opportunities for some wonderful action shots. 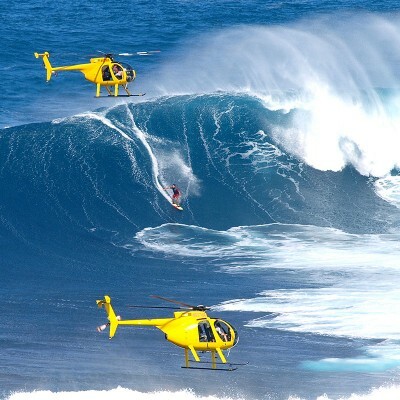 In addition to Jaws, also known as Peahi, Ho’okipa is a favorite spot to capture surfing images. Other areas include Lahaina, Honolua and, when the summer swells are up, a variety of locations on the south shore of Maui. Most of the images in this gallery are shot with a telephoto lens, ranging from 200mm to 800mm. The shooting style is often high sequence, meaning a burst of 10 frames/second is taken to ensure capturing the right moment of action, grace, style and drama.